For two years I’ve been writing that Democrats and the Obama administration should forget about reforming taxes and focus on raising them instead. The idea of reviving 1986-style tax reform—i.e., swapping lower rates in exchange for fewer deductions and exemptions—was first floated by the esteemed co-chairpersons of the Simpson-Bowles commission. All too quickly, the concept was embraced by right-thinking people in Washington, including, on the “left,” President Obama and Sen. Max Baucus, D.-Montana, chairman of the finance committee, and, on the “right” Rep. Paul Ryan, R.-Wisconsin (then-ranking member on the House Budget committee), and Mitt Romney (then as now a presidential candidate). There were significant differences between how Democrats envisioned tax reform and how Republicans did, but everyone seemed to agree (albeit with varying degrees of sincerity) that three things needed to happen. 3.) The deficit needed to be reduced. Now the eminently respectable Sen. Charles Schumer, D.-N.Y., who as a House member voted for the 1986 tax reform, has come forward to say (in a speech delivered today to the National Press Club) that he’s good with 2.) and 3. ), but not so much with 1.) He’ll get a lot of crap for saying so. I don’t agree with all of Schumer’s reasoning, nor all of his conclusions. But basically, he’s right, and more power to him for saying it. Tax reform “just doesn’t fit the times,” Schumer said, “because there are two new conditions that didn’t exist in 1986, but that are staring us in the face today: a much larger, more dangerous deficit, and a dramatic increase in income inequality.” Correct. In 1986 the budget deficit was $221 billion. That was not deemed a trivial amount at the time, but today’s $1.1 trillion budget deficit is much bigger both in actual terms and as a percentage of GDP, and the national debt, Schumer points out, is nearly twice what it was in 1986. As for inequality: In 1986 the top one percent consumed 16 percent of the nation’s income (before taxes and outlays), which was bad enough; by 2007, it was consuming 24 percent. (During the recession the one percent’s income share tumbled to 18 percent, but in 2010, the last year for which data are available, it grew to 20 percent, and there’s every reason to believe it’s been climbing at a fast clip ever since). What Schumer proposes instead is to let the top marginal income-tax rate rise to 39.6 percent; to increase the top capital gains rate, narrowing but not eliminating the inequitable gap between taxation of capital and taxation of wages; and to eliminate enough tax loopholes to make a solid down payment on the deficit without raising taxes on the middle class. I’m all in on the first idea. I’m mostly in on the second (but would prefer to eliminate the gap completely, as Reagan did in the 1986 tax reform). As for the third, I’m less squeamish than Schumer (or Obama or Romney) about saying outright that one way or another taxes will have to rise on the middle class too. But wouldn’t raising taxes on middle incomes skew income distribution even further toward the rich? Not if you laid in a few additional, higher marginal tax rates on incomes above $250,000. 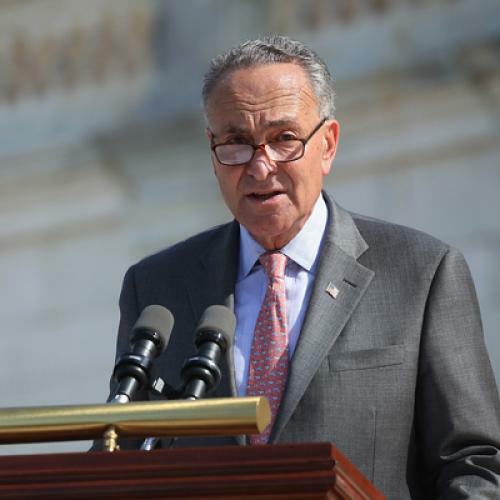 Schumer said in his speech that he didn’t think we should return to a top marginal rate of 50 percent, which is what it was prior to the 1986 tax reform bill. But I’d actually like to go all the way up to 70 percent, the top rate before Reagan came into office. Isn’t adding new tax brackets the opposite of what we did in 1986? Well, yes. But in 1986 it was easier to embrace the goal of “tax simplification” because there were 15 brackets rather than today’s six going up to 50 percent rather than the 39.6 percent that will prevail after Jan. 1. The dirty little secret of today’s “tax reform” discussion is that (setting aside the loophole issue) taxes are already pretty simple. Too simple, in fact. We need to complicate them a bit. The best part of Schumer’s speech is where he points out that Democrats are holding more cards in this game than is generally recognized. Polls show the public supports Democrats on taxes more than Republicans. “This is causing Republicans to rethink their approach,” Schumer said. “Just look at Governor Romney. In recent weeks, he has gone to great lengths to moderate his tax proposal to appeal to a broader audience–going so far as to promise in last week’s debate that he would not reduce the net tax burden on the wealthy at all.” Precisely. Schumer cites a headline in today’s Financial Times: “Republicans Shift On Taxing The Rich.” I’ve been noticing that since the GOP convention. Plus, “the scheduled expiration of all the tax breaks at year’s end gives Republicans incentive to act.” Here Schumer contradicts himself a little by suggesting even he would be willing to raise taxes on middle incomes if the alternative were to extend tax cuts for the wealthy. But never mind. He’s right. So how about this. We go with Schumer’s anti-reform tax plan. Republicans will reluctantly sign on. Then, in a couple of years, let’s double-cross ’em like Poppy Bush and Bill Clinton did by raising rates and increasing the number of brackets. That would capture, I think, the proper spirit of 1986. Correction. An earlier version of this column made erroneous reference to Rep. Paul Ryan as “D.-Wisconsin” rather than “R.-Wisconsin.” We regret any emotional damage this error may have inflicted on Ryan, his family, or his running mate.